Published on Friday, August 12, 2016. This article appears in the August/September 2016 issue of American Craft Magazine. Higashi and Ando in their shared workspace. 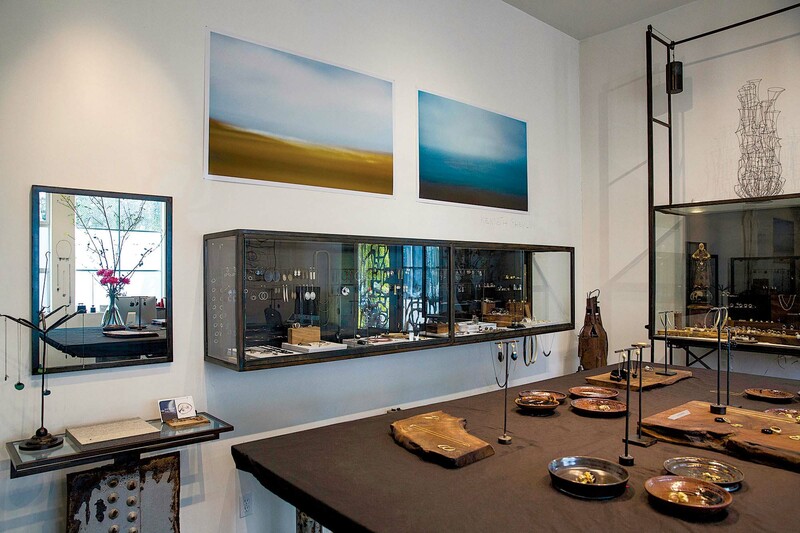 April Higashi, jewelry designer-maker and gallery owner, chose the Japanese word shibumi as the name of the gallery she founded 11 years ago. 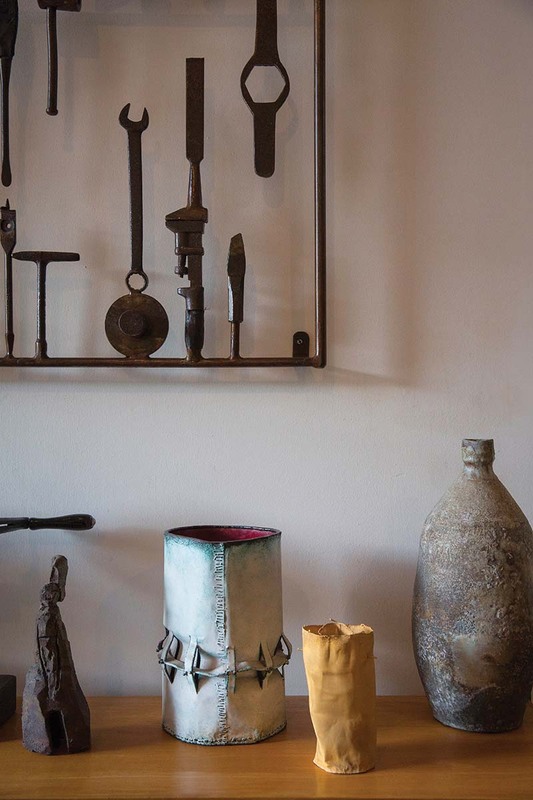 From its featured artists to its overall design, Shibumi Gallery flawlessly reflects the meaning of that term: a subtle, unobtrusive, and deeply moving beauty cherished by artists and connoisseurs alike. Higashi embraces the concepts of both shibumi and shibusa – an openness to nature and appreciation of irregular forms – when designing jewelry and her living space. 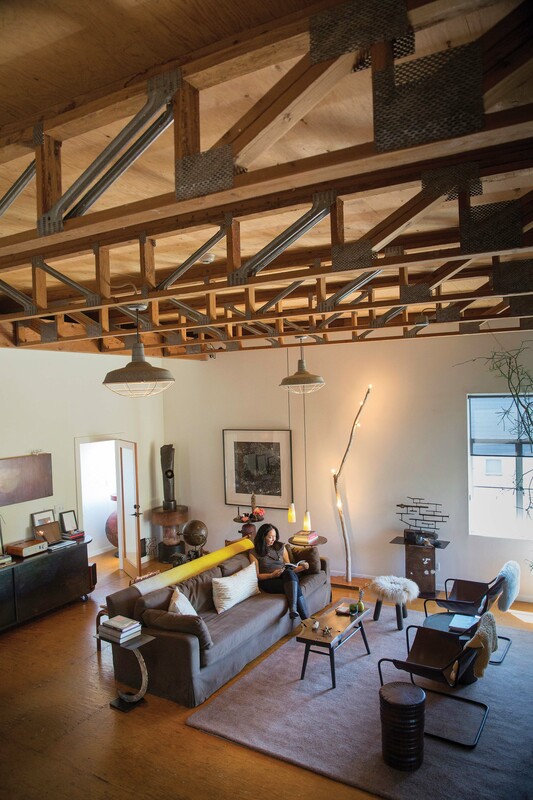 Her adjoining home and gallery are nestled in bustling West Berkeley, California, a neighborhood defined by its diversity; breweries, artist galleries and studios, steel foundries, restaurants, and craftsman-style homes all coexist here. For all of the liveliness of the neighborhood, Shibumi Gallery and Higashi’s home provide a sanctuary of considered calm and creativity. You came to the Bay Area for college, earning a BFA in the early 1990s, and have lived here ever since. Tell us about your house – why you chose it, who lives here, and how it’s designed. My home is an industrial corrugated-metal, three-level, mixed-use building built in the ’80s. I’ve lived here for 12 years. 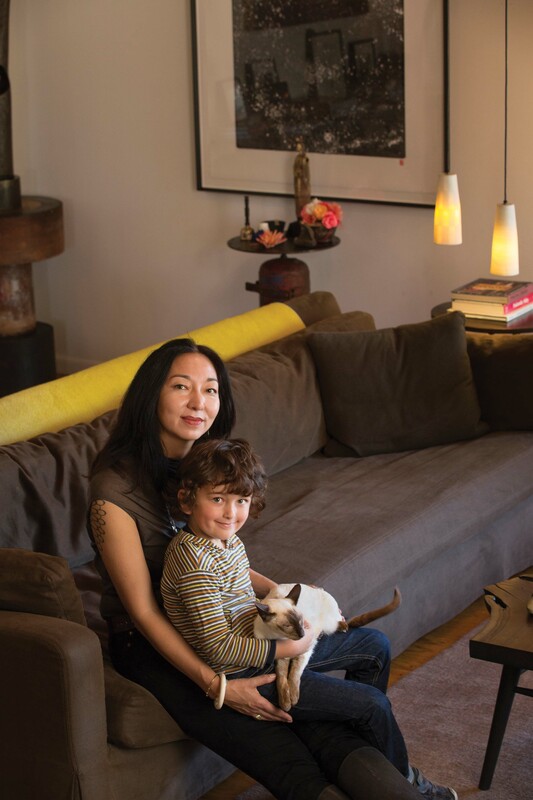 With me are my son, Ando, who is 6, and my Siamese cat, Yuko. When I found this place, I was very excited about its many spaces and environments. The first floor has a big workspace and gallery that opens onto a huge yard with bamboo and sculptures. The second floor is an open space with a kitchen, living room, and a converted deck that is now my son’s room. The top floor houses my bedroom, which feels like a little nest where I can get away from it all. While most of the spaces are open-format, there are particular areas you can close off when you need to. I also love that there are different levels. Each one seems to convey a different aspect of our life: work, live, sleep. Your gallery and work studio are on the first floor. What are some of the challenges and rewards of living in the same space where you work? I have a staff of eight people, so six to seven days a week someone is here working. Sometimes I’ll pop through the gallery to check in on my staff and spontaneously get to see a client or friend. I am not a super-private person, but when I want solitude, I travel to totally get away. I have a design space on a desk downstairs, and Ando has a desk right next to it, where he has set up his drawing tools. When I design, Ando can draw right next to me. He also loves to have his friends here so he can play and draw with them. Since I live and work in the same building, I can really be a mom and run a business. My roles may overlap, but that’s a small trade-off. 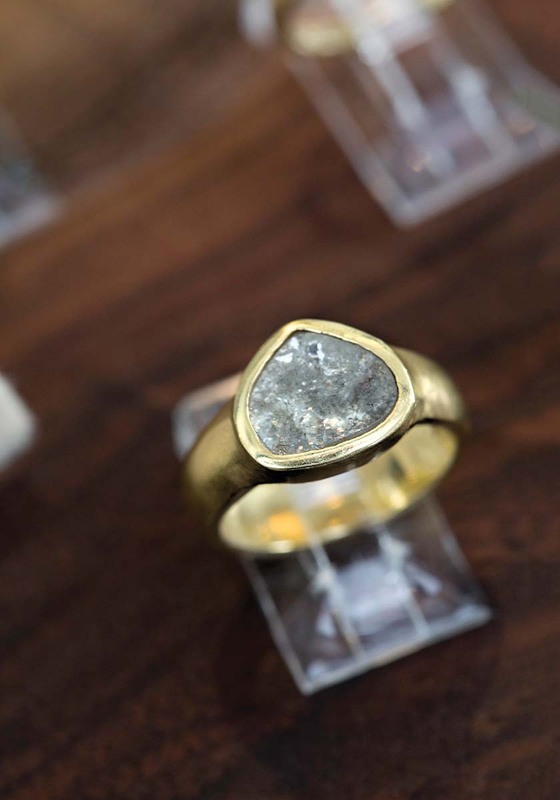 How does your work as a jewelry designer and jeweler influence your home’s décor? I am always trying to contextualize individual elements, whether it starts with a stone, a custom piece I am making for a client, or the beautiful feathers I found in my son’s pocket that I add to a display on a bookshelf. My architect friend said that he loved Japan because everything is considered. This is something I strive for in all aspects of my life. You and your ex, sculptor Eric Powell, are good friends; he lives two houses away, and you parent Ando together. How do your lives intersect? We built our creative lives together. We were and are still great collaborators. My gallery and home are filled with his sculptures and custom things he has made. I still also show and promote his work to my clients. As parents, we get together and talk about our son – everyday things like “Is he asking to watch too much TV, has he started talking about girls?” Occasionally we share a meal. It feels really healthy. We have maintained the good parts of our relationship and are still a support system for each other while maintaining separate lives. It makes me happy that we have risen above the hard issues to accomplish this. We also have a great network of friends, and that helps in our extended family. Our son thinks he is lucky because he has two houses. Honestly, since we are both artists, we probably are better parents, since we each get a break to focus on our creativity and then spend time with our son separately. I think he’ll grow up knowing he was loved and surrounded by interesting people. How have you chosen to furnish and decorate your home? I love mixing artisan-made pieces with modern classics. I want my home to feel warm, artsy, and comfortable. I have small collections from sculptor Alma Allen, Woodsport furniture maker Scott McGlasson, and treasured vessels by my mentor and dear friend June Schwarcz, who passed away last year at 97. I also have mixed jewelry into my displays. I’ve invested in modern pieces by Hans Wegner, Norman Cherner, Paulo Mendes da Rocha, Tom Dixon, and George Nelson. I have tried to cultivate a modern aesthetic that exudes warmth. Some say my home has a feeling of Japanese peacefulness to it. I like to layer wood with metal and use both earthy and bright colors. I love a hint of the early ’60s that I, on occasion, gravitate to in both my home and in some of the pieces I design. 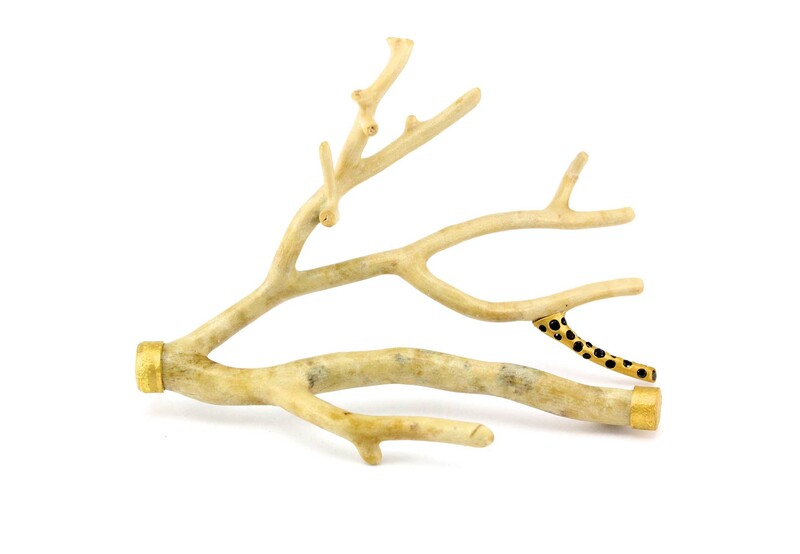 I also am always dragging home things from nature – branches, rocks, flowers – to add into my displays. Sometimes they are things my son made or found himself. I like him to feel that his eye and the things he likes are important in our home. What are some of your most treasured objects? I have a cabinet of curiosities that is in a found turn-of-the-century case I had refinished. It holds nature objects and mementos of importance, including my son’s umbilical cord, a vessel from June Schwarcz, and my Japanese American Tutu’s passport. [Tutu is a Hawaiian term similar to “Grandpa.”] Tutu was a painter and world traveler who meant a lot to me and was very supportive of my choice to live life as an artist. How is your gallery an extension of your home? How do the two spaces reflect each other? I have art openings every two months for different artists. Oftentimes if the artist is from out of town, she’ll stay in a spare guest room on the first floor and we’ll share meals together. It’s really wonderful to get to know the people I show. I’ve also had a few artist friends rent from me short-term. They sometimes help with events. Like my work, my life is an organic combination of people and their talents. Sometimes it’s a little crazy, but I like the surprises of combining talents and people and seeing what happens. What are some of your favorite gatherings that you’ve hosted? For one of my birthdays, I created a speakeasy bar and dance party and hired two bartenders who created custom artisanal cocktails. For Ando’s one-year birthday party we had our favorite steamed-bun food truck pull into the backyard to feed all of our new-parent friends. In Japanese cultures, making it to one year is a big deal. I also hosted an art show for Ando and two of his best friends when they were 5. It was really funny when clients I didn’t know wandered into the back and actually bought some of their work. Ando was so excited when he sold a sculpture of army men glued together for $100. He ran over to sign it before it left. Elka Karl is a writer in Berkeley, California. The spacious living room, filled with art, mementos, and objects from nature, is a favorite gathering place. 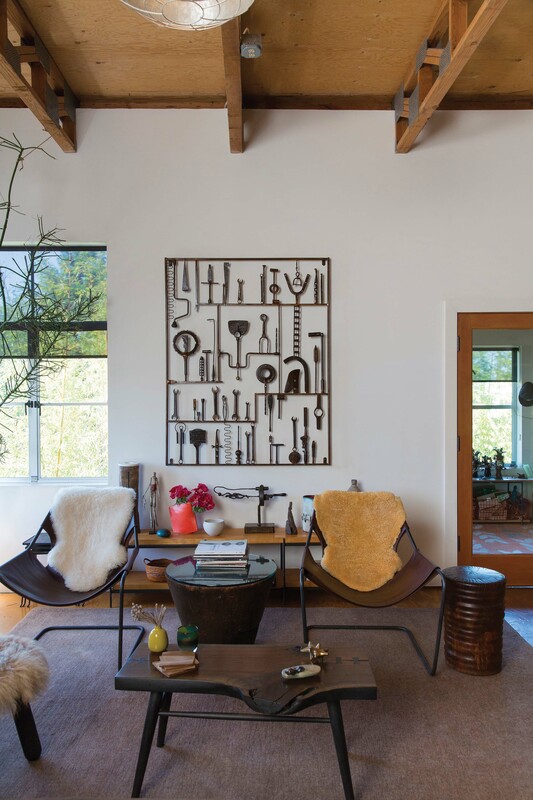 Work by Powell fills the space, along with Alma Allen sculptures, a Woodsport stool, and a driftwood floor lamp by Anzfer Farms. 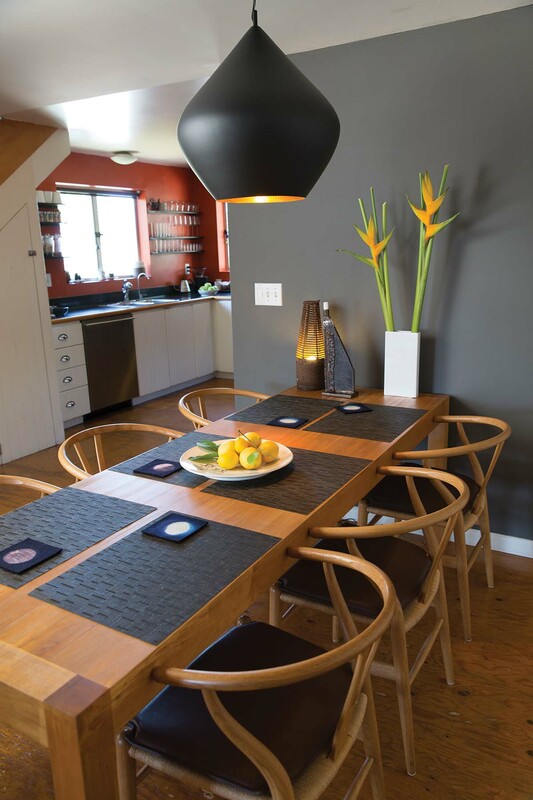 A Tom Dixon pendant light hangs above the dining table; the hand-dyed coasters are by local textile designer Ocelot. 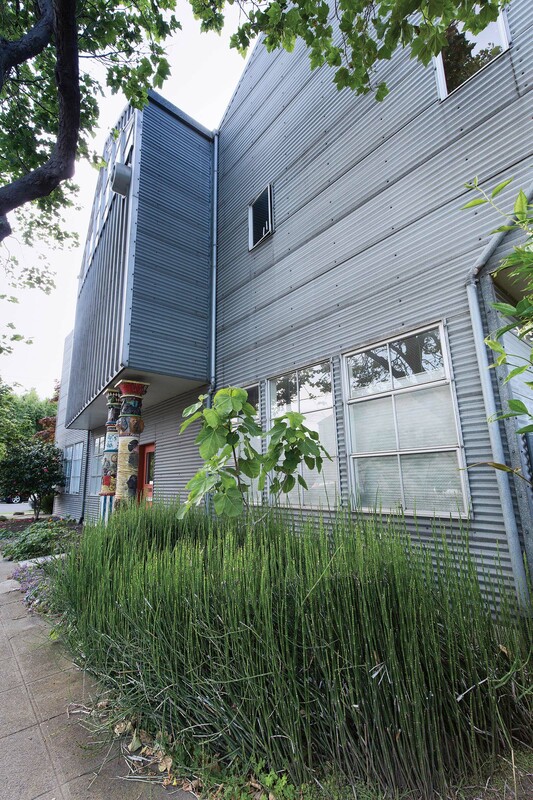 The corrugated steel façade of Higashi’s 1986 home reflects the industrial history of the eclectic neighborhood where she lives and works. In Higashi’s peaceful living room, a Scott McGlasson table faces an Eric Powell wall piece. On the bench are white and gold vessels by the late June Schwarcz, Higashi’s friend and mentor. 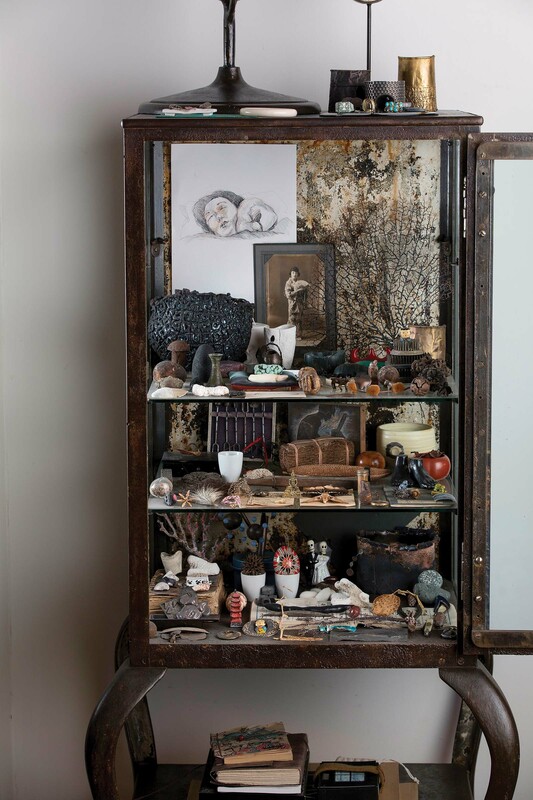 A found steel and glass cabinet is filled with prized personal objects – a photograph of Higashi’s grandmother, her grandfather’s passport, her son’s umbilical cord – along with small artworks such as graphite sculptures by Agelio Batle and a porcelain cup by Brigid O’Hanrahan. White and gold vessels by the late June Schwarcz, Higashi’s friend and mentor. 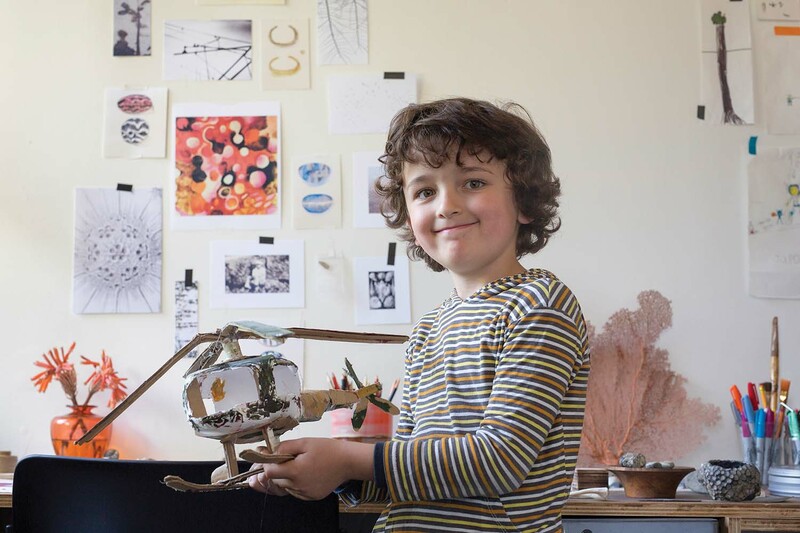 Ando, 6, shows off a cardboard helicopter he built with his father, who lives two houses away. At this home, Ando’s desk adjoins Higashi’s, making it easy for the two to spend time drawing and painting together. Higashi’s gallery features work from some 40 national and international artists, along with her own work. Kenneth Shevlin’s pinhole photographs of the California coastline overlook a table of work by Christina Odegard. 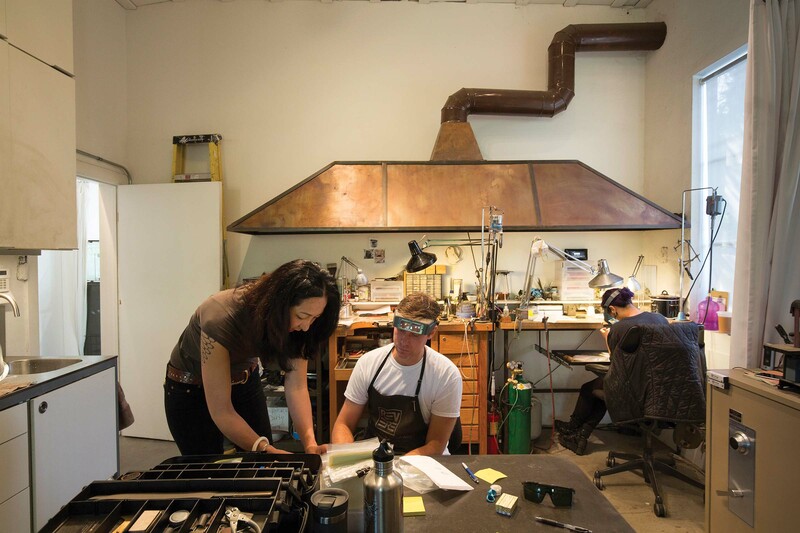 In her downstairs workspace, Higashi consults with lead goldsmith Ben Faryna. Most days, at least one artist is working here. The door to the left leads to the gallery. 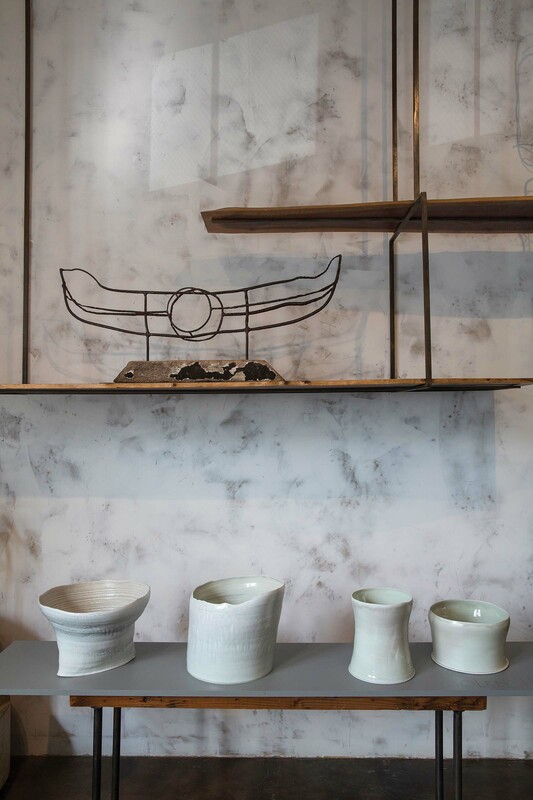 A sculpture by Powell, who is Ando’s father, and porcelain vessels by Olen Hsu grace a Shibumi Gallery wall. While many creative people struggle to keep work and home life separate, Higashi excels at their integration. In her tranquil home, she makes jewelry, supervises other artists, runs a gallery, and enjoys life with son Ando and cat Yuko. 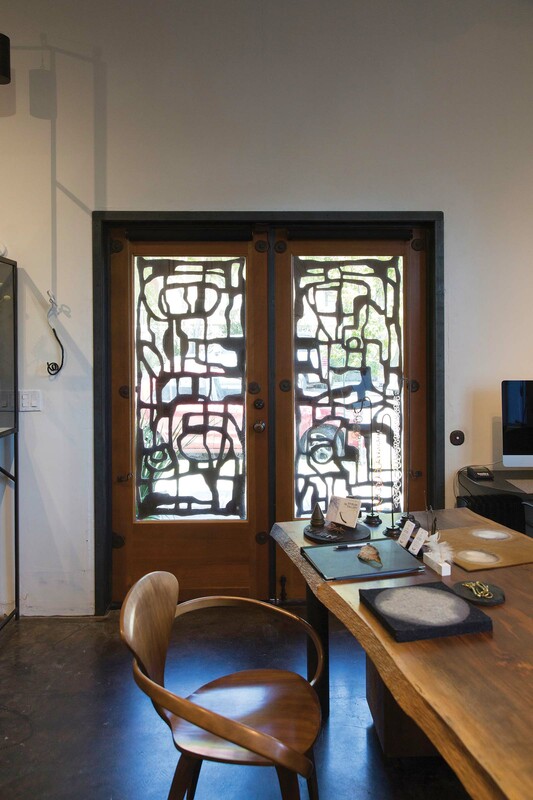 Steel and wood doors by sculptor Eric Powell frame the entrance to Shibumi Gallery on the first floor of April Higashi’s home. She and her staff meet with clients at the live-edge walnut table encircled by Norman Cherner chairs.